Companies are always on the lookout for new ways to increase their exposure and visibility to boost their eventual profitability. One of these new techniques that brings brands and companies an increased amount of traffic and clientele is influencer marketing. It allows to touch upon different audiences, via different channels that might have been unreachable before. Companies are always on the lookout for news ways to increase their exposure and visibility to boost their eventual profitability. One of these new techniques that brings brands and companies an increased amount of traffic and clientele is influencer marketing. It allows to touch upon different audiences, via different channels that might have been unreachable before. But what influencer marketing actually is, is sometimes still considered a vague or grey area by companies. It can be described as a ‘softer’ type of marketing as it involves ‘regular’ people recommending products via photos, videos and blogs. Social media channels have become lucrative channels that are used by companies to push their products & visibility. Reaching out to audiences via these channels in such a manner is thus considered as an alternative type of advertising. The people providing their channels to communicate by, are people that are just like you and me. They often have a fulltime job on the side but were nevertheless able to create an engaging identity for themselves that inspires others to follow them. The community that they have gathered on their social channels fits with their lifestyle, product preferences and personality. They have become a person of inspiration that is worth taking advice from. So, who are these influencers? An influencer can be a person that loves putting on makeup and has a passion for getting dressed up for nights out or even special themed parties such as Halloween. Sharing these videos on YouTube and websites can attract other people out there who are looking for advice on how to apply their makeup and what products to use. Influencers show the products, step by step, during their tutorials. 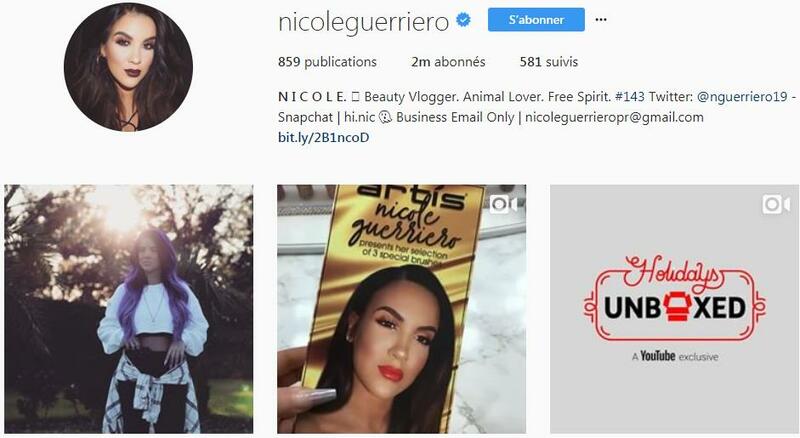 An example of this is Nicole Guerriero, she has gather over 2M followers on Instagram account. Nicole is able to reach over 2,8M people during one YouTube tutorial, making it a great opportunity for beauty companies to have her recommend their products to her audience. For beauty companies this would not only mean getting visibility for 2,8M viewers but also getting a greater relevance in the life of the consumer as well as an increase in conversion rates. But besides beauty vloggers, there are many different types of influencers out there. For the fashion industry the so-called fashionistas that would make a great match. For the technological devices, the tech-savvy individuals that are trying all types of new gadgets would be a great choice. For many types of products, there are influencers out there that are able to communicate on these products to their audiences. How to find marketing influencers? But finding the right influencer for your brand and product is not always easy. Depending on your financial back up you won’t be starting with a well-known influencer such as Nicole to promote your products. Finding micro-influencers that fit your budget and your brand, are most easily found by the use of specialized platforms. These are specialized in providing you with influencers that you can pick from based on personality traits, lifestyle, and social media audience size and engagement rate. Choosing the right influencer for your brand is crucial as the influencer will be an ambassador of your brand. He or she needs to have the same norms and values as your company supports, in order to send out aligned messages. Having the right person in place can do wonders for your communication but choosing the wrong influencer can damage your brand image and will cost you money. The interest in influencer marketing has increased drastically over the last years and shows a turning point in the market. People can be reached in a new and effective way via their personal social feeds and at a fairly low cost. For this reason, E-commerce Nation has performed research in collaboration with Reech. The research aims to uncover the value of this type of marketing and the quickly growing interest of companies to integrate this in their communication plans. The research has shown that numerous companies are looking into including influencer marketing in their strategies for the upcoming year. The fairly innovative communication strategy is slowly being adopted and shows great potential for investments. All participants of the research indicated to be allocating a bigger budget to influencer marketing. Besides the growing interest, the research also uncovered reasons for the choice of influencer marketing. Companies mentioned that obtaining new leads was their biggest objective. Using the right influencer, allows to tap into new audiences which increases their lead generation as well as brand exposure. There expectancies with this marketing are a return on their revenue, social shares and media visibility.